The stomach is the main food storage tank of the body. If it were not for the stomach’s storage capacity, we would have to eat constantly instead of just a few times each day. The stomach also secretes a mixture of acid, mucus, and digestive enzymes that helps to digest and sanitize our food while it is being stored. 1. 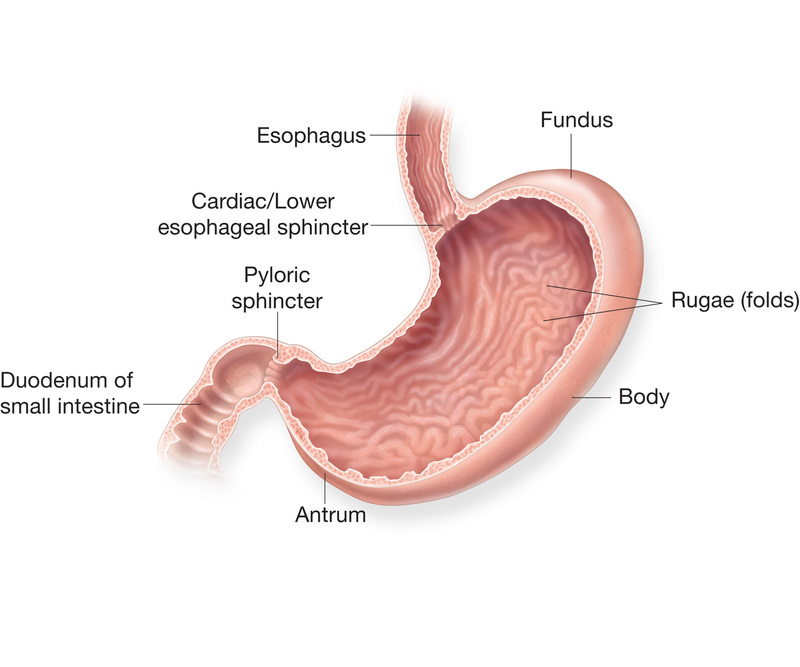 The esophagus connects to the stomach at a small region called the cardia. The cardia is a narrow, tube-like region that opens up into the wider regions of the stomach. Within the cardia is the lower esophageal sphincter, a band of muscle tissue that contracts to hold food and acid inside of the stomach. 2. The cardia empties into the body of the stomach, which forms the central and largest region of the stomach. 3. Superior to the body is a dome shaped region known as the fundus. 4. Inferior to the body is a funnel shaped region known as the pylorus. The pylorus connects the stomach to the duodenum and contains the pyloric sphincter. The pyloric sphincter controls the flow of partially digested food (known as chyme) out of the stomach and into the duodenum. - The innermost layer of the stomach is known as the mucosa, and is made of mucous membrane. The mucous membrane of the stomach contains simple columnar epithelium tissue with many exocrine cells. Small pores called gastric pits contain many exocrine cells that secrete digestive enzymes and hydrochloric acid into the lumen, or hollow region, of the stomach. Mucous cells found throughout the stomach lining and gastric pits secrete mucus to protect the stomach from its own digestive secretions. The mucosa of the stomach is much thicker than the mucosa of the other organs of the gastrointestinal tract due to the depth of the gastric pits. - Surrounding the mucosa is the submucosa layer of the stomach. The submucosa is made up of various connective tissues, blood vessels, and nerves. Connective tissues support the tissues of the mucosa and connect it to the muscularis layer. The blood supply of the submucosa provides nutrients to the wall of the stomach. Nervous tissue in the submucosa monitors the contents of the stomach and controls smooth muscle contraction and secretion of digestive substances. - The muscularis layer of the stomach surrounds the submucosa and makes up a large amount of the stomach’s mass. The muscularis is made of 3 layers of smooth muscle tissue arranged with its fibers running in 3 different directions. These layers of smooth muscle allow the stomach to contract to mix and propel food through the digestive tract. - The outermost layer of the stomach surrounding the muscularis layer is the serosa – a thin serous membrane made of simple squamous epithelial tissue and areolar connective tissue. The serosa has a smooth, slippery surface and secretes a thin, watery secretion known as serous fluid. The smooth, wet surface of the serosa helps to protect the stomach from friction as it expands with food and moves to mix and propel the food.